Here was my latest challenge: Dessert for someone who isn’t eating dessert. 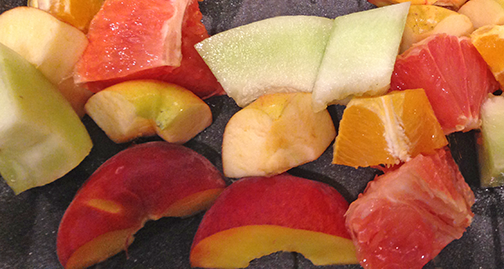 I love fruit salad, but let’s face it…fruit salad isn’t really dessert. It’s more like a side dish for dessert. So what to do to make the end of the meal just as special as the food that preceded it? I’ve been to plenty of events that offer small pieces of fruit on skewers. Merely a fancy presentation for what is simply a mini fruit salad. But put that fruit on the grill, and voila! Now that’s special!! And it was. The grilled fruit recipes that I’ve seen almost always involve adding sugar, but my approach was to let the heat do all of the work at releasing the innate taste sensations waiting within. No, it didn’t just taste like hot fruit. The grilling process brings out a creamy lushness in the flavors that is hard for me to describe, but absolutely thrilling and satisfying to the palette. And it isn’t just the “sugar avoiders” who enjoy this. 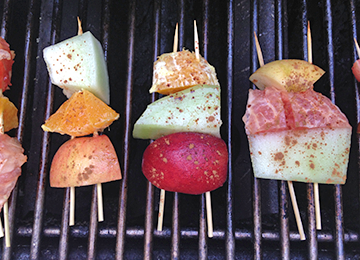 Last week, these grilled fruit kebabs were the only dessert I served, and no one was complaining—or felt like he or she was missing out on something more indulgent (which is saying a lot for my dessert-loving friends and family). This is another of my ultra-flexible recipes. I’ll explain the framework for what and how I did what I did, but then have a good time experimenting with the fruits and flavors you enjoy. Honeydew: I sliced each half into wedges about one-inch across at the widest point, cut the fruit off of the rind, and then cut each wedge into lengths of about 1-1/2 inches. 3. Make the skewers. I used three pieces of fruit—with two bamboo skewers—per kebab. 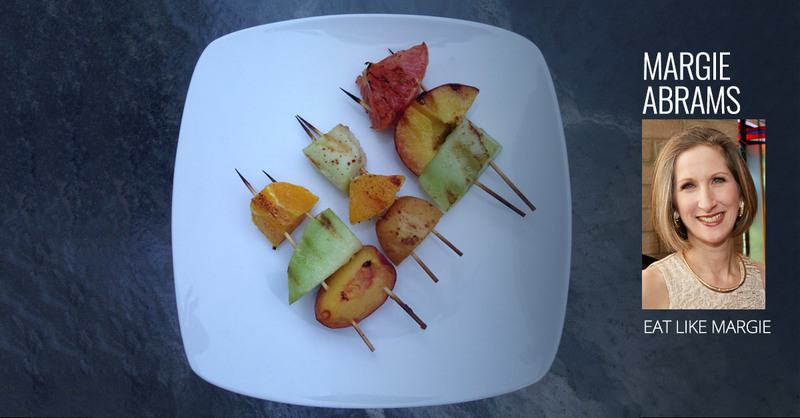 The first time I made these, I made the mistake of using a single stick per kebab, but was reminded to switch as soon as I tried turning them (the fruit pieces swing around only one stick, making them extremely difficult to turn). 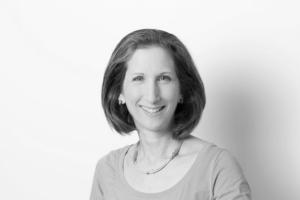 It’s a trick I learned from Linda Gassenheimer in this recipe for grilled vegetables. Place the skewers about half an inch apart. Place completed kebabs on a big pan. 4. Lightly sprinkle completed kebabs with cinnamon. Then lightly spritz with olive oil spray. 5. Turn kebabs over, and sprinkle and spritz the second side. 6. Place kebabs on the grill. Cover and grill for three to four minutes. Turn them over and grill for another three to four minutes. If you find that you absolutely can’t live without a little bit of added sweetness, I recommend adding a few drops of maple syrup or honey after you grill, since sugar will burn on the grill. (I know some people like that, but it’s really toxic!) Or, for a further-tantalizing taste treat, boil some unfiltered honey with a pinch of saffron, and drizzle that over the grilled kebabs. Heavenly!